Andy (you should have been here yesterday) Cowley and I decided on another 2 days on the H.Avon. I had a friend Frappers coming down on one of the days. I thought about getting down there early however with the much needed rain pouring down I didn’t leave until late in the morning. Andy did much the same. I arrived at about 1pm and walked a couple of long stretches to see what was about. I found some barbel feeding and some chub. Andy had been urging me to use free lined meat for the chub. I found some on a far bank run. There were some good fish there some well over 5lbs possibly 6lbs. Out came a soft 11ft Avon rod with 6lb line. It was a difficult cast over some weed and under a willow. First couple of attempts were OK ish. However on the third go a chub pulled hard on the rod top as it took just under some weed. It buried itself in the weed but by moving downstream I was able to coax it out. No monster but a lovely start to the day on a new method for me. I couldn’t buy another bite in the swim. I’m not too surprised really. 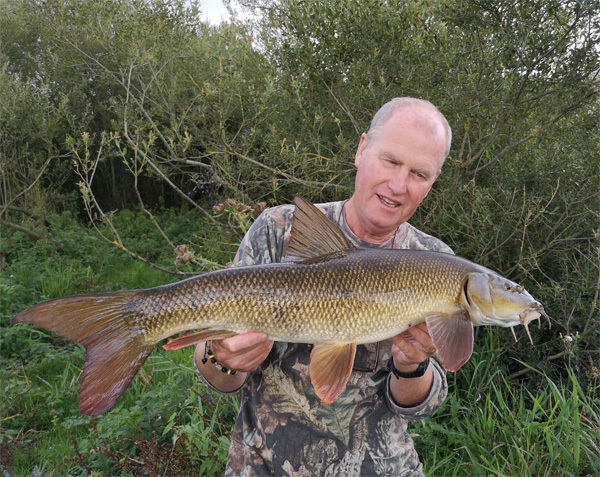 I had seen two barbel in a swim one was a double and the other a single while walking back. So I locked this away in my mind for use later in the day perhaps. I wandered to another spot where there is supposed to be a 7lb chub. I could get about 5 chub feeding however none of them looked to be 7lbs. I walked up the same stretch of river but on the opposite bank. 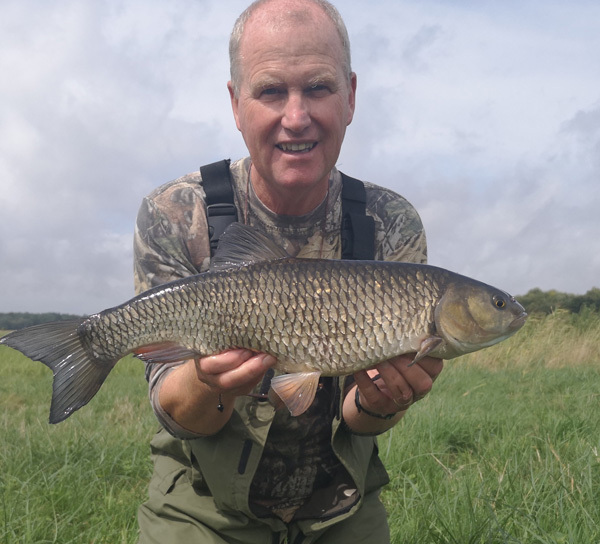 I couldn’t see any barbel or chub where as in July it was packed with them. About another 300m upstream I put a few pellets in where Andy had seen a barbel. Then I put a few more in about 75m upstream in a slightly deeper stretch. It was difficult seeing into the river as we had some showers in the afternoon so light levels were low. I carried on upstream again and found a lovely swim across the far side of the river however there was thick weed from me to the area. I threw some pellets in and watched some big dark shapes come out from beneath the willow branches. Probably about 8 of them. These were chub for sure and some big ones at that. Possible a 6lber too. So feeling pleased with myself I headed up to where I had seen the chub and barbel. They were all out feeding again on the few pellets that remained. I had to wait a while for them to get off the gravel. I was using a 2oz semi fixed lead and a short braided hooklink with some tungsten sinkers keeping everything pined down on the river bed. I fired out a few more pellets followed shortly by the rig with a PVA stocking full of pellets. Resting the rod on some reeds with the line lightly resting on the weed on my half of the river. After 20 mins the rod shifted a good 4ft then tugged again quickly. I picked the rod up and nothing there. Must have been a hook pull by the look of things. The fish had scattered so i quickly recast into the same area and sure enough it wasn’t long before all the fish were on the munch again. this time I was a little more prepared for the bite. The rod slammed over once again this time everything held tight. The fish rushed to get into the far side willows not once but twice. I saw it flash and was pleased to see a bronze flank. At least it was safe in mid river. 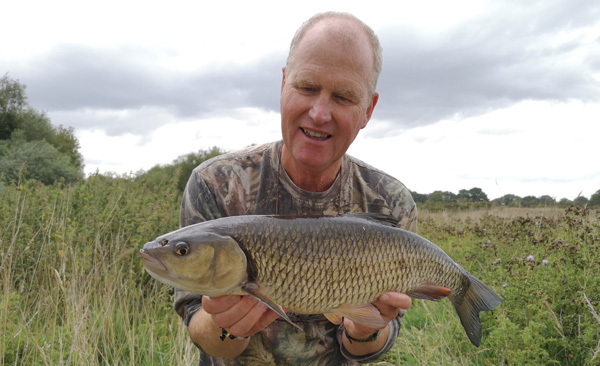 Now all I had to do was guide it through the weed down to my waiting landing net downstream. All went well enough without any scary moments although pulling it downstream was easy, pulling it upstream mission impossible. Unfortunately it was the smaller of the barbel but any barbel off the Avon is a hard earn’t fish. What a beauty. By this time it was 7pm and Andy reckoned I should head back to our digs to cook dinner. How good is that. Well to be fair he was providing the cider and food. At 9pm my friend Steve Frapwell arrived to stay the night too. I was going to try and catch him some chub the following day. He too had a couple of ciders and time drifted on and it 11.45 before we retired to sleep. This entry was posted on Wednesday, August 22nd, 2018 at 8:09 pm	and is filed under Uncategorized. You can follow any responses to this entry through the RSS 2.0 feed. Both comments and pings are currently closed.